The land of Jianghu is filled with unique and exciting stories, share yours today! 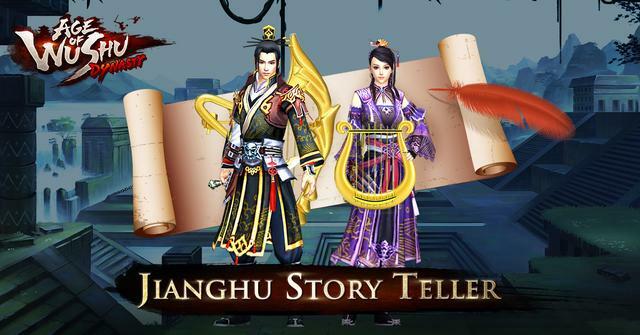 Join in our awesome new Jianghu Storeteller event to share your awesome tales of adventure in Age of Wushu Dynasty, and you can win rewards as well as being featured on our website! Stories can be anything - surprising outcomes to tough matches, unique strategies or approaches to tough problems in the game, friends made or enemies/rivals acquired - whatever your experience has been, we'd like to hear it! Submit your story in short paragraph form on the submission thread above, and we'll review the submissions every week. Top submissions will be chosen and contacted to get more details for a full spotlight feature on our Official Website, as well as receiving a reward of in-game gold! Share your story and become a famed storyteller today! Note: This event is ongoing, no set end date, all submissions will be considered on their merit.